So you may have heard that Black’s was opening on Riverside. 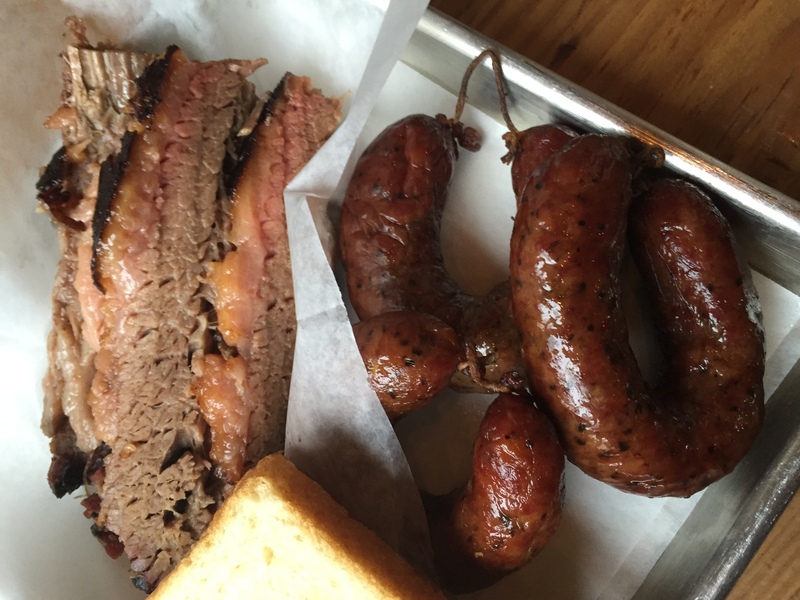 No need to drive out to Lockhart for a bite of delicious Black’s brisket. Unlike Smitty’s, Black’s quality stayed consistent throughout the boom in popularity and Food Network attention, and it continues to be some of the best and easily obtainable (I can’t wait any longer for you, Franklin) Q in town. Thing is, brothers Mark and Mike, grandsons of the original Black, were the ones who decided on Riverside…a move the rest of the family was apparently none too thrilled about. 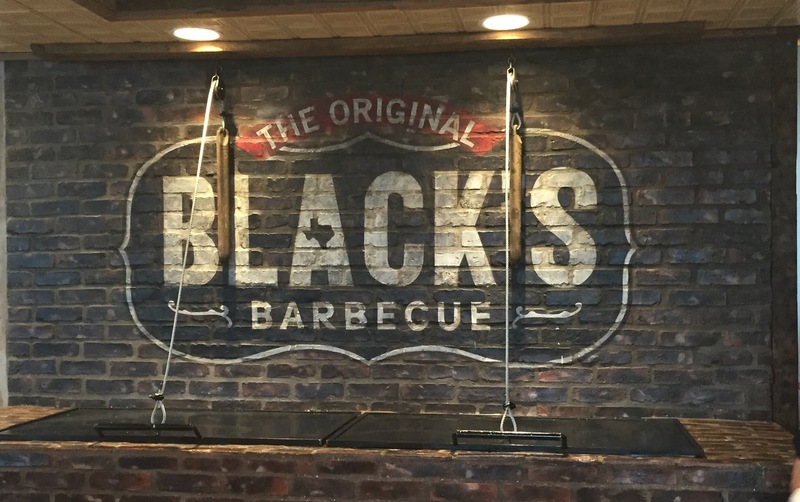 Their uncle, Kent, felt that if Black’s was going to bother to open in Austin, it better be done right. 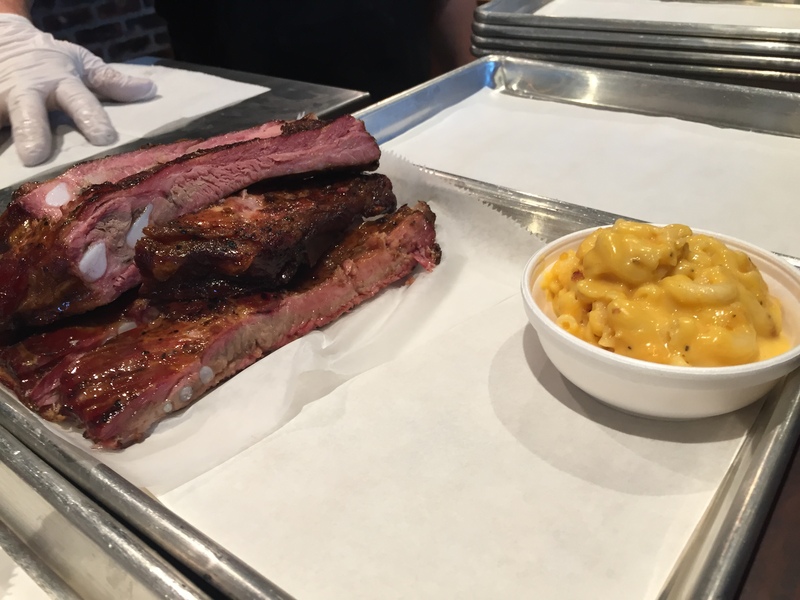 And since Kent is the one with the rights to the name, the Original Black’s BBQ opened 3110 Guadalupe Street right near campus in October of this year. Which means it’s best to go when UT isn’t in session. And there’s no game or festival going on. A day like Saturday December 27th. As expected, The Original Black’s on Guadalupe has everything right down to beef ribs. Links of sausage, original and jalapeño cheddar, were $2.49 a piece. 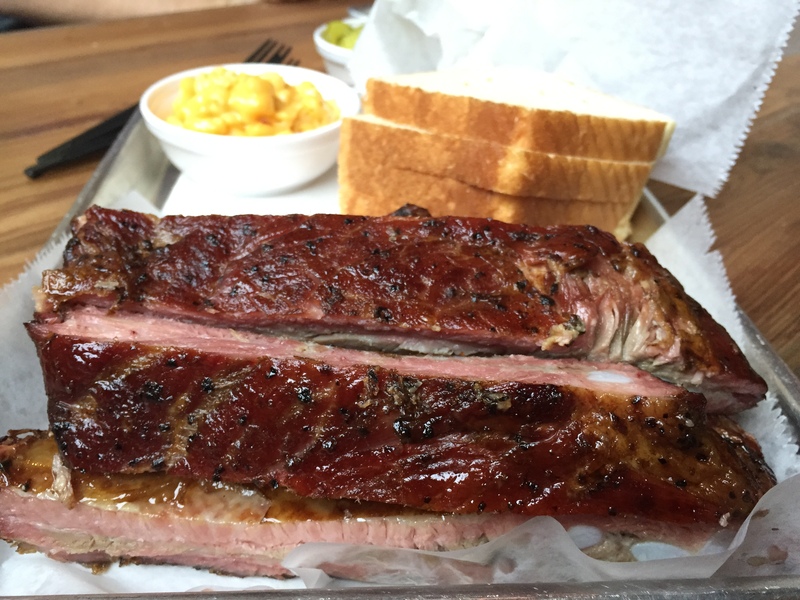 The Pork ribs were the spare cut – the BEST cut – as St. Louis style falls to a close second and baby backs being just a joke meant for those who want sauce over meaty fatty melt in your mouth pig flesh. The point is that Black’s is a pro that doesn’t cater to that which isn’t worth it. Their brisket in Austin is just as delicious as their brisket in Lockhart and their sides are standards. All the pickles you can eat, standard cole slaw, über cheese mac, sweet potatoes with marshmallows, potato salad, etc. Our order was a small (single) mac & cheese, a single cole slaw, 6 pork ribs, 1/2 lb brisket mixed, and each of the kinds of sausage. The total came to $53. Black’s had plenty of local beers in cans, including a variety from Austin beer works, various bottled and fountain sodas, and, because this is Austin, Topo Chico. Their prices are more expensive than on their website, gotta figure that’s due to their new space and Austin’s rent. Their brisket was $16.50 a pound and the ribs were about $15 a pound. Their beef ribs were about the same. The sides were cheap at a couple of bucks a piece. 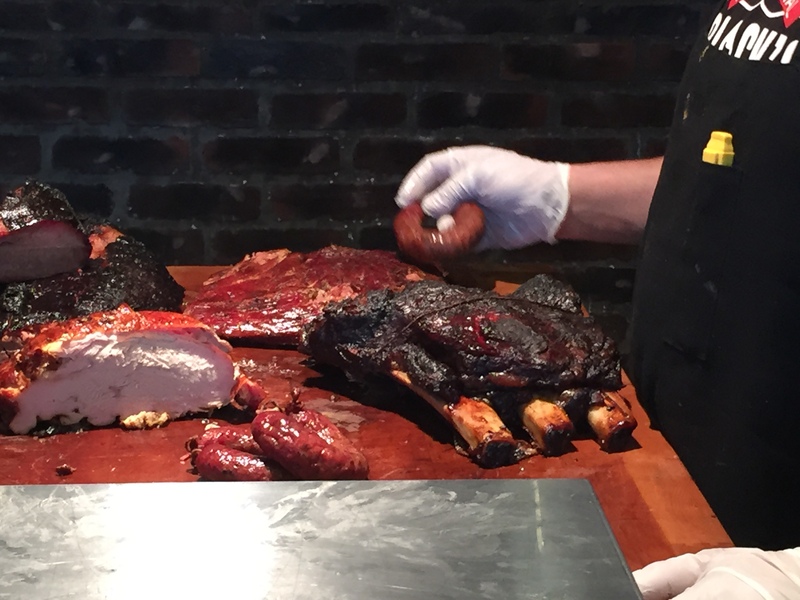 There’s a lot of BBQ in and around Austin. I used to wait until I really needed that melty meat and drive all the way out to Lockhart, pick my favorite cuts from my favorite places and finish off everything with a $1 ice cream cone from Smitty’s. That and their “ambiance” are just about the only reason I stop in there any more. I no longer have to get out there. I love Micklethwait Craft Meats. They’re incredible, but they’re busy enough now where they’re going to need a brick & mortar stat. I was significantly less than impressed with Stiles Switch. And Aaron Franklin is our city sweet heart, known to be a good guy with great eats, doesn’t even need to be touched on. I’m sure I’ll eventually get around to trying Terry Black’s. But now that I know I can get real Black’s brisket and ribs real close, there’s no rush. 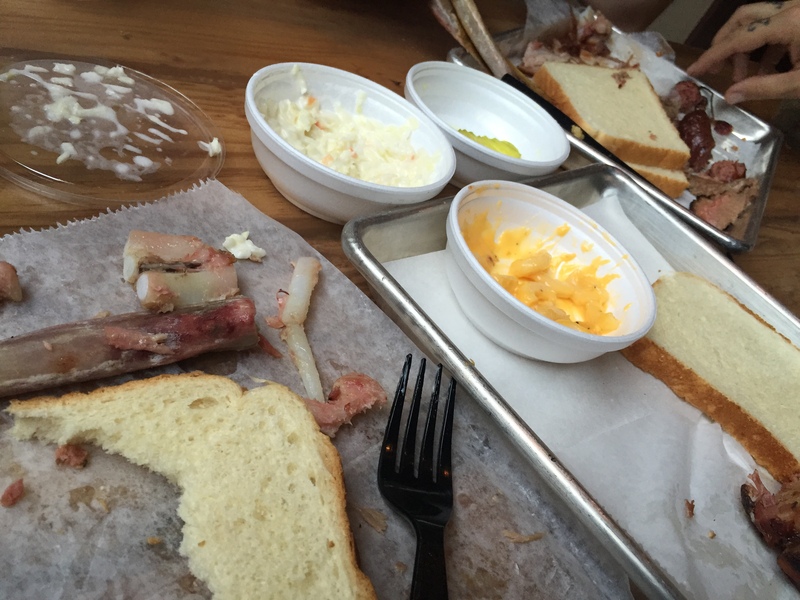 This entry was posted in Entertainment, Gastro Graze, Pop Culture and tagged austin, austin360, barbecue, bbq, black, blacks, brisket, original blacks, restaurant, ribs, sausage, terry blacks.